Memorial Day is just around the corner and for me that (usually) means summer is officially here! With the warmer, sunnier, and longer days I'm finding both my clients and my friends are finding more opportunities to drink cocktails, microbrews, chilled wine, (or other drink of choice). For whatever reason we seem to associate certain activities and seasons with various beverages. Growing up spending summers on The Cape, each afternoon we looked forward to cocktail hour on the porch after burning to a crisp on Neel Road Beach. The adults sipped cape codders and g&t's and us kids sipped ginger ale & cranberry juice. With the warmer days, it's nice to come home after a long day to sit on the porch, beverage in hand, enjoying the last few hours of sunshine. I don't blame you. But do we really need multiple drinks each night? This time of year, with what seems like more opportunities to drink more frequently, it can be a tough balancing act when trying to lose weight or reach your health goals. Last week, I shared my tips for Choosing a Healthier Cocktail with my email subscribers (if you missed it you can download the tips below). I wanted to follow up with some actual healthier cocktail recipes. As always, the goal is not to be on a diet but rather to make healthier choices to benefit your health long- term. 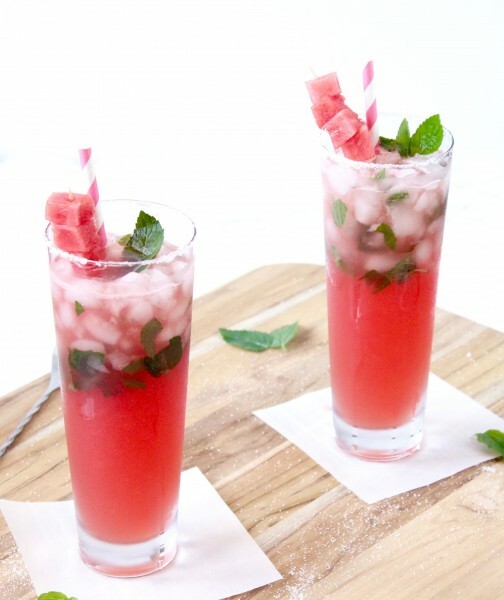 The recipes and tips (above) are meant to help you choose healthier beverages without feeling deprived or like you're missing out on the fun. Because we wouldn't want that! Keep these in mind for all your summer cookouts! To Live & Diet in L.A.
Abbey also shares tips for choosing lower calorie cocktails, a Mango Kombucha Margarita and a Watermelon Mojito! The next two are mocktails, but do as you please - add your favorite liquor or sip as is. Thank you to all the fabulous RDs who contributed recipes to this post! Be sure to check out their sites for more recipes and nutrition tips!